Autograph Letter Signed, to Mr. Barrett, about the purchase of his book. 1 page 7 x 4½ inches, in good condition, with the original envelope. British Museum, 8 April 1895. 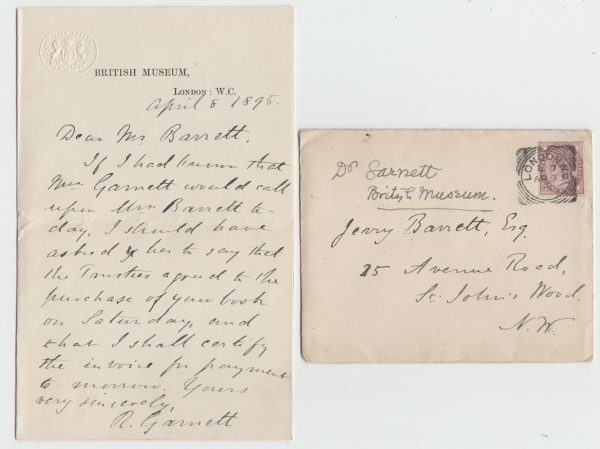 Richard Garnett (1835-1906), writer and bibliographer, author of verse, critical works and biographies (Shelley, 1862, Carlyle 1883), keeper of printed books at the British Museum (1890-99).